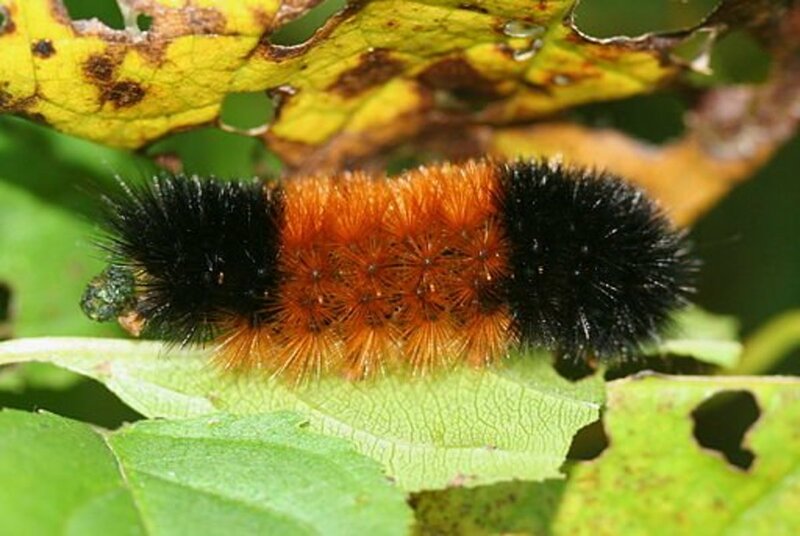 Some attractive caterpillars live in North America. Their colours and decorations are very impressive. Some of these caterpillars sting, however, including puss and saddleback caterpillars. Observers should examine these insects without touching them or while wearing heavy-duty gloves for protection. The effects of caterpillar venom range from mild and short-lived to serious enough to require emergency medical attention. In some cases, a severe allergic reaction or respiratory distress may develop. The symptoms depend on the insect species involved, the amount of venom that a person absorbs, and the person's individual susceptibility to harm from the venom. Venomous animals inject, poisonous animals secrete. For example, venomous snakes inject a venom into our body through hollow fangs as they bite us. The skin secretion of poison dart frogs harms us by a more passive process. When we come into contact with a frog's secretion, it may be absorbed into our body through cuts in our skin or through our mucous membranes. The words venomous and poisonous are often used interchangeably. Technically, however, they mean different things. A venomous animal must bite, stab, or sting its victim in order to inject a venom. We have to bite or eat a poisonous animal or touch it without being bitten, stabbed, or stung in order to be poisoned. The harmful caterpillars that I describe in this article sting humans with spines. Therefore they are technically venomous. They are often referred to as poisonous, however. In everyday life, this doesn't really matter. The unpleasant effects of the caterpillar chemicals on our body are the same whatever terminology we use. 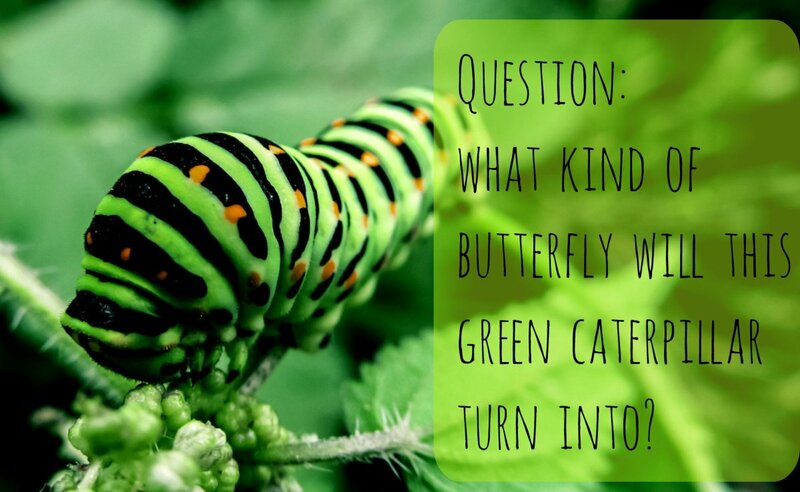 Caterpillars are the larval forms of moths and butterflies. These insects belong to the order Lepidoptera. The insect's life cycle contains four stages: egg, larva (caterpillar), pupa, and adult. The caterpillars look very different from the adults and feed on different food. The pupa often appears to be an inactive stage, but this is far from true. Inside the outer covering of the pupa, the caterpillar's body undergoes a dramatic change as it turns into a moth or butterfly. This change is known as complete metamorphosis. Caterpillars molt (lose their outer covering) as they grow larger. The outer covering of an insect is called the exoskeleton. Unlike us, insects don't have an internal skeleton. When an insect's exoskeleton is lost as a result of molting, a larger and softer exoskeleton is revealed. This expands and hardens, giving the insect room to grow. The different stages between the molts of a caterpillar are called instars. The caterpillars in the different instars may be significantly different from one another with respect to both size and appearance. 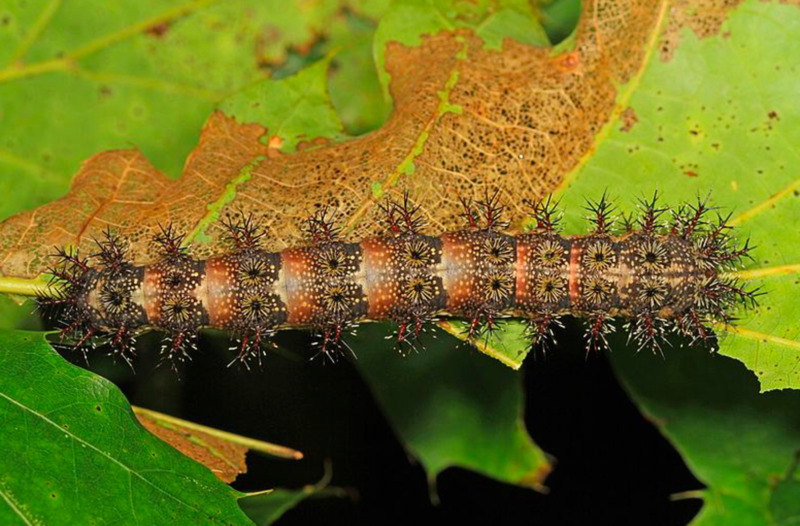 The photos in this article show the mature caterpillars. The pupal stage of a butterfly or moth is often known as a chrysalis. Many moths create an additional covering for the pupa made of silk. The silken covering is called a cocoon. How Do Stinging Caterpillars Hurt Us? Stinging caterpillars don't deliberately reach out to humans and inject venom as a snake might do. Instead, their spines pierce our skin when we touch the insects. The spines are hollow and are connected to a venom sac (or, as it's more often called, a poison sac). Venom is found within the spines and enters our body as the spines penetrate our skin. Some spines become detached from the caterpillar's body when we touch the insect. This is why a common first aid tip for a sting is to place sticky cellophane or Scotch tape over the wound. When the tape is peeled off, it should carry spines with it. The chemicals in most stinging caterpillar venoms haven't been identified. The effects of the venom are well known, however. The puss caterpillar (Megalopyge opercularis) is also known as the asp caterpillar. Both names sound very appropriate to me. As the first name might suggest, the caterpillar appears to have long, soft fur. Some people—including young children—may be very tempted to stroke the "fur". Touching the caterpillar is not a good idea, however, because venomous spines are hiding amongst the soft fur. Each instar of the caterpillar is hairier than the one before. The last instars have so much hair that their actual body can't be seen. The caterpillar has a teardrop shape and is variable in colour. It may be grey, yellow, or red brown. It has a tail-like structure at its posterior end. The insect is small and is only around 1.2 inches to 1.4 inches long. Despite this seemingly insignificant size, it's potentially very harmful. I've never been stung by a puss caterpillar, and I'm glad that this is the case. The sting is said to be very painful. The caterpillar is considered to be one of the most dangerous in the United States and sometimes the most dangerous of all. The caterpillars feed on the leaves of various trees and shrubs and often stay out of the range of humans. They sometimes fall to the ground, however. Occasionally, they are unusually numerous. At these times they may defoliate trees and present a greater threat to humans. 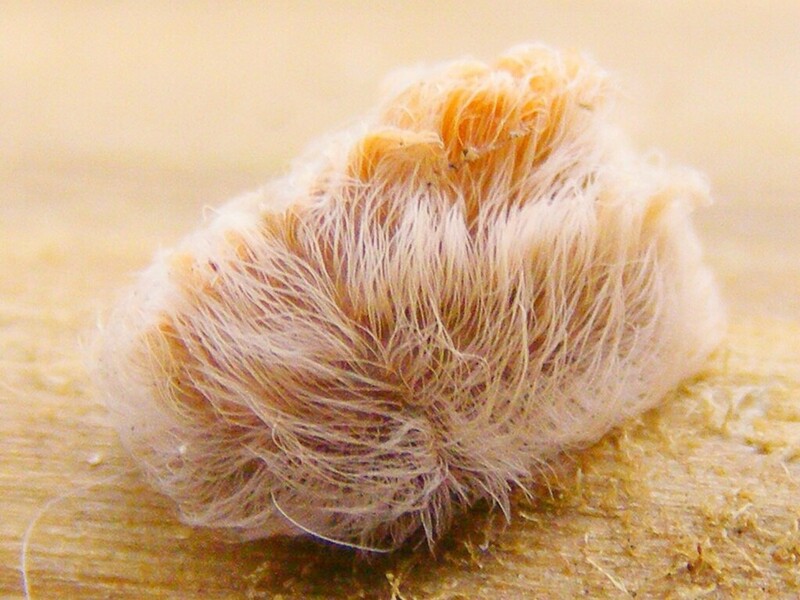 The adult form of the puss caterpillar is known as the southern flannel moth. Like the larva, it has an attractive and furry appearance. Also like the caterpillar, it's small in size and reaches a length of 1.0 to 1.5 inches. The hairs and bristles of insects are technically known as setae. Although setae may look like human hair, they have a different structure and are made in a different way. Our hairs are solid and are made of a protein called keratin. Insect setae are hollow and are made of a carbohydrate called chitin. Chitin is the main component of an insect's exoskeleton. 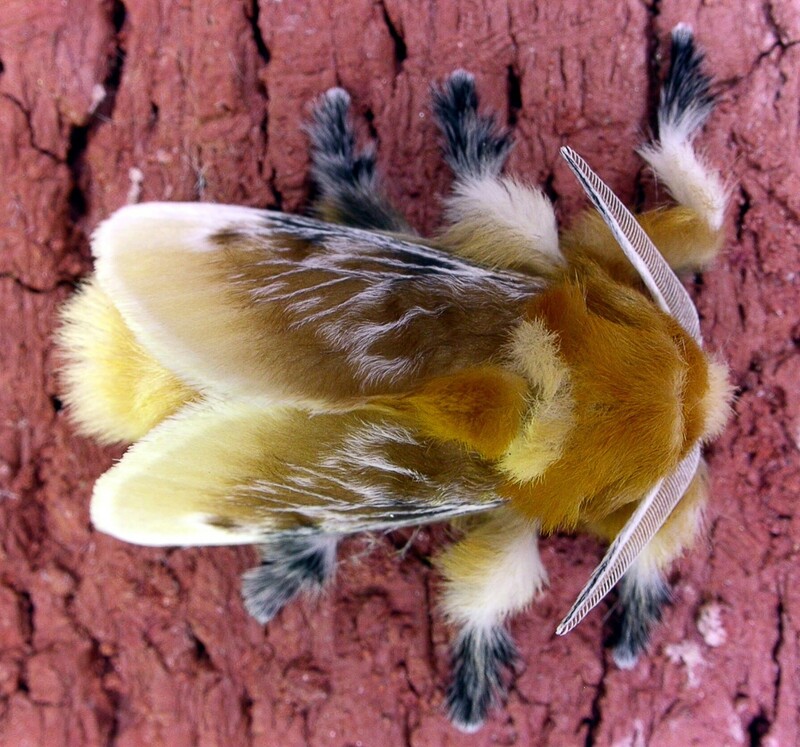 The southern flannel moth is found from New Jersey to Florida and west to Arkansas and Texas. It is common in Florida but reaches its greatest abundance in Texas. The chemical makeup of puss caterpillar venom is unknown. Researchers have discovered at least one dangerous component in the venom of a closely related species, however. They say that the venom of Megalopyge (or Lagoa) crispata contains a particular protein that can act as an enzyme and trigger harmful reactions. A person may not experience all of the symptoms. In addition, the symptoms are worse in some people than in others. The spines of dead caterpillars may still contain venom and be dangerous. They shouldn't be touched without suitable hand protection. 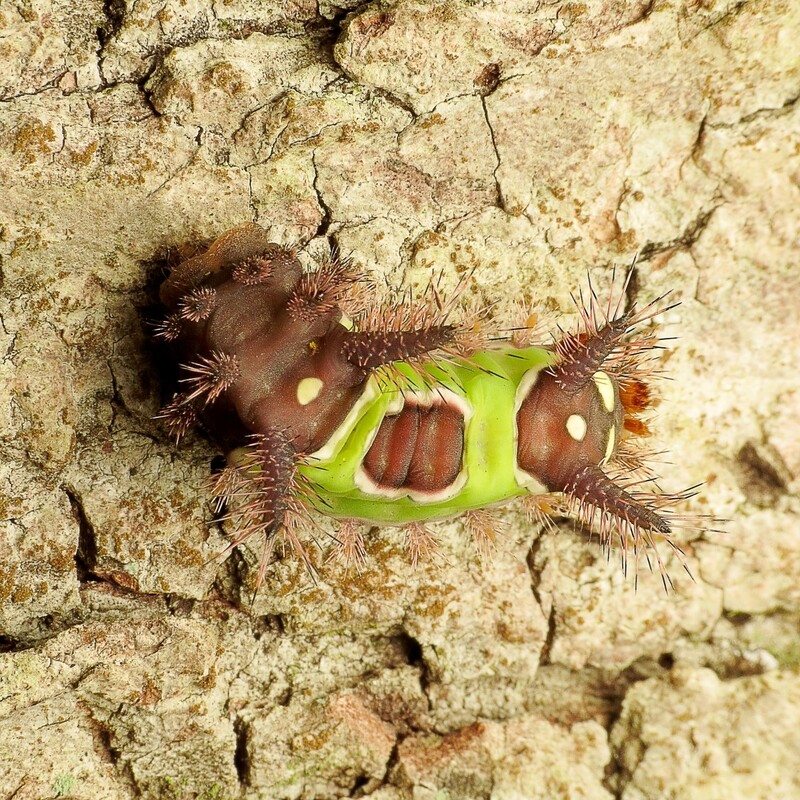 Saddleback caterpillars (Acharia stimulea) are brown in colour with a green "saddle" in the middle of their back. The saddle has a brown spot in its middle section. The caterpillar has two horn-like structures at the front end of its body and two at the back. It also has smaller protuberances on its body. The dramatic appearance of the insect is believed to act as a warning of venom presence to would-be predators. The large light spots at the end of the body look somewhat like eyes and may also serve to discourage a predator attack. The caterpillars belong to a family known as the Limacodidae. The larvae of this class are known as slug caterpillars due to their method of movement. The insects feed on the leaves of a wide variety of deciduous trees and other plants. They are sometimes found on corn. They aren't considered to be a major agricultural pest, however. 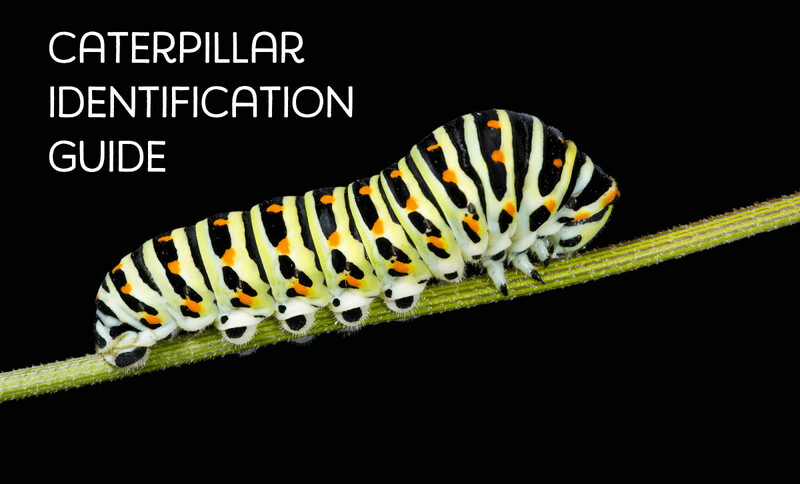 In the eastern United States, the caterpillars are able to survive in both the temperate climates in the north and in the warmer climates of the south. Acharia stimulea has a wide range in the eastern United States, occurring as far southward as Florida, northward to New York and Massachusetts, and westward to Texas, Indiana and Kansas. 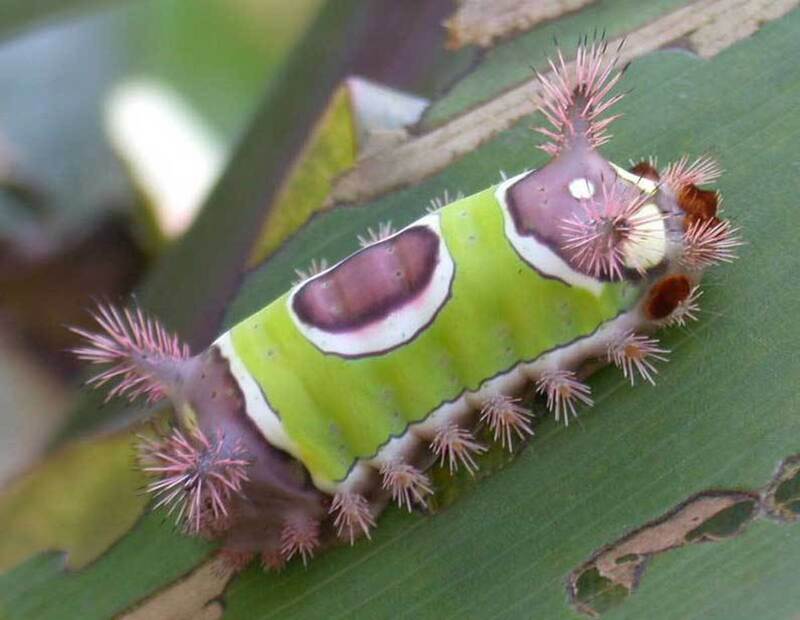 According to the University of Florida, the effects of the saddleback caterpillar's venom are second only to those of the venom from the puss caterpillar's family (the Megalopygidae). Someone who is stung may experience only a burning or itching sensation. Some people report that their caterpillar sting produced worse pain than a bee or wasp sting, however. The pain often lasts for one to several hours and then gradually weakens, but it may last for days. Some people experience such a severe response to a sting that medical attention is necessary. As in the case of the puss caterpillar sting, people may develop symptoms beyond the wound or experience an allergic response to the venom. It's best to admire the caterpillar without touching it in any way. I read a comment from one victim who said they used a stick to move a saddleback caterpillar into a better position for a photograph. The stick brushed against the person's skin and caused significant pain. Clothing that comes into contact with the insect should be washed before being worn again. 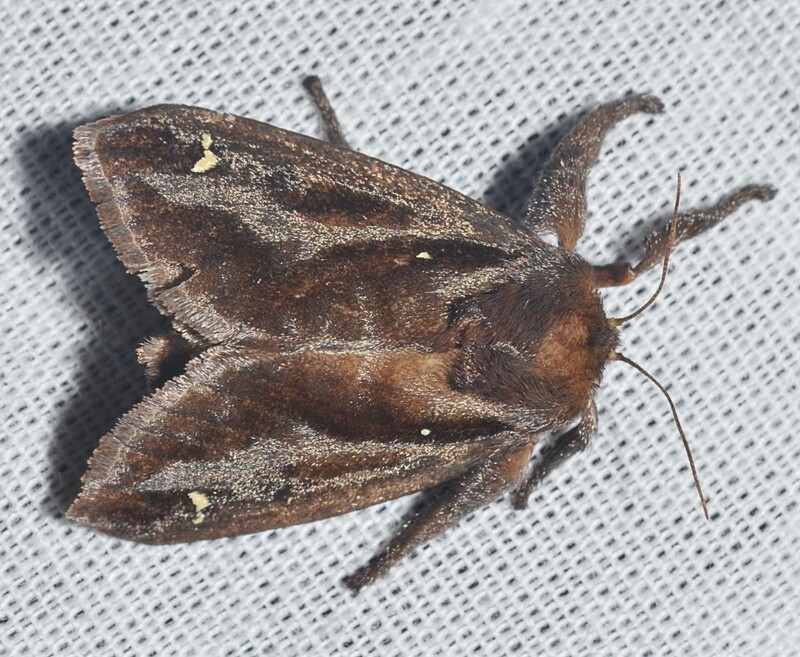 The adult moth is a glossy dark brown colour and has a fuzzy appearance. A few light spots can be seen on the generally dark background of the insect. The moth lacks a special name and is simply referred to as the "saddleback caterpillar moth". Care should be taken if around a cocoon of Acharia sp., as this genus is documented to weave urticating (irritating) spines into the silk layer as well. Like bee and wasp stings, first aid and patience as the symptoms weaken and disappear may be all that's required to deal with a caterpillar sting. Some situations may require an immediate visit to a doctor, however. Seven of these situations are listed below. Anyone that is concerned about the effects of a caterpillar sting should visit a doctor, even if the conditions listed above don't apply to them. The National Poison Control Centre suggests that people perform the following first aid steps if they are stung by a caterpillar. If the caterpillar is in contact with the body, remove the insect without touching it. Place sticky tape over the wound. Peel off the tape to remove caterpillar hair and spines. If the area is itchy, apply a paste of baking soda and water. If the baking soda doesn't help, apply a hydrocortisone cream. If the hydrocortisone doesn't help, apply an antibiotic cream. With reference to the hydrocortisone and antibiotic creams, the Poison Control Center points out that "some people have skin reactions to these creams". The Merck Manual article referenced below (which was written by an emergency physician) offers similar suggestions for treating a puss caterpillar sting. It suggests that rubbing alcohol and calamine lotion be applied to the wound instead of the hydrocortisone and antibiotic creams, however. It also suggests that an ice pack be applied as a final step. These steps may help all types of caterpillar stings. Most caterpillars are not dangerous. They are interesting creatures to observe, unless they are munching on garden plants or agricultural crops. It's probably a good idea to avoid touching them unless the observer is certain that they are not venomous. In areas where stinging caterpillars live, children should be taught to watch but never touch a caterpillar without an adult's permission (or without the permission of a younger person who recognizes the caterpillars). They will probably understand this requirement if the dangers of the insects are described. Children who are still too young to understand or follow the instructions should be watched carefully during the time of year when the caterpillars appear. Adults should be careful, too. The insects should be avoided whenever possible or admired from a distance. Many stings appear to be accidental, however. People report that the insects are sometimes found on the underside of the leaves of their garden plants. A gardener may not even see the insects until they have been stung. In these cases, first aid procedures should be useful as well as medical attention if it's necessary. Are puss caterpillars’ stings hazardous to dogs? Yes, they sometimes are. The dog’s coat protects most of the body, though a dog is occasionally stung through the coat. Most stings occur on the pads of the paws, in the mouth, or somewhere on the face. The ASPCA link (American Association for the Prevention of Cruelty to Animals) that I give below describes symptoms and treatment of caterpillar stings in dogs. Of course, if first aid doesn’t work, the dog should be taken to a vet. A dog stung in an eye should always visit a vet. I want to point out one thing about the ASPCA recommendations. The page says that dogs can be given NSAIDs (non-steroidal anti-inflammatory drugs). This recommendation is aimed at vets, not pet owners. Pets shouldn’t be given NSAIDS (such as aspirin) that are intended for humans. A vet can prescribe a safer version that is designed for dogs. The other medications mentioned in the article must be prescribed or administered by a vet as well. Thanks for the comment. I hope you see a doctor if the symptoms get worse or if you get stung again. Getting stung twice in three days sounds very unpleasant! I was stung a couple days ago and again today by saddleback caterpillars (or maybe even the same one). The one a couple days ago I had no idea what had stung me, but I saw the culprit today. Having happened twice within 3 days, the symptoms were much more severe this time. Thank you for treatment advice, as I had no clue where to start. This article is a treasure trove of information. I did not realize there was a difference between poisonous and venomous until I read your article. It was also very well written. Thanks for the visit, Audrey. I hope your little one never experiences the pain of a caterpillar sting. This is very useful to keep my little one safe. Thank you! Thanks for sharing your experience, Nikki. I've read that stinging caterpillars are becoming a problem in the UK. I hope you don't get stung again! 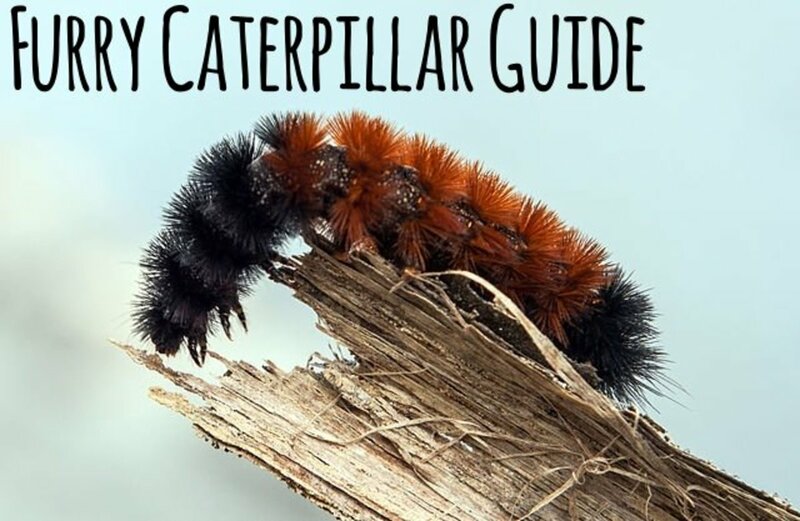 Thanks for sharing such an interesting and helpful information on caterpillars, I had come into contact with one last summer, and it was much itchy.Got stuck on my leg from some parking, took it out but it was itchy for two days. Didn’t know what to do, but certainly now, would use your guidelines if it happens in future. I agree, Devika. They are beautiful insects, even though they can sting. Wow! This is amazing! Beautiful creatures and have their defensive issues too.New to me and have not seen any of it. Hi, Tim. I appreciate your comment. I think wearing gloves while doing yard work is a great idea, even when the local caterpillars aren't dangerous. It's nice to protect the hands from potential problems. Thanks, Linda. Superb information about such interesting insects found throughout N. America. I'll wear gloves when doing yard work certainly now. Hi, Peggy. Thank you for the comment. It's good to watch out for stinging caterpillars. I enjoy observing all caterpillars, though, whether or not they sting. This is surely an interesting and informative article Linda. I don't think that I have ever spotted any of these particular caterpillars but will surely heed your warning should I ever come across them. Thanks for writing this. Thanks, Larry. It seems to be the time of year when some people start talking about poisonous caterpillars! My wife and I were discussing poisonous caterpillars just the other day. Hi, Thelma. I appreciate your visit and comment. Thanks for sharing your experience, Natalie. It sounds interesting and unpleasant at the same time! Thanks for the heads up. This is very interesting and informative as well. I didn´t know how to handle the sting but now I know. In Maryland though, we had both of the ones you mention and one year there was an infestation of puss caterpillars I think that defoliated the trees. It was awful. You could look out over the distance and see trees that were fine the day before but now had no leaves! Everyone was told to avoid them and try to stay inside as much as possible as they sometimes fell from the trees onto people and stung them when coming into contact with bare skin. We also had some kind of giant silkworm that stung but I don't remember what that one was. I haven't seen that many caterpillars in Chicago but will be keeping a watch from here on out! Hi, Penny. It might be useful to know how to deal with a caterpillar sting as summer approaches. I hope you (and I) don't get stung this year. Very useful information. I knew how to remove a bee sting, but never ran across how to deal with a caterpillar sting before. Thank you very much for the kind comment, Liz. This is an extremely informative and well-illustrated article. Hi, Bede. Thanks for the comment and for sharing the interesting information. I'd like to visit more places in both Canada and the United States to observe the wildlife and plants. 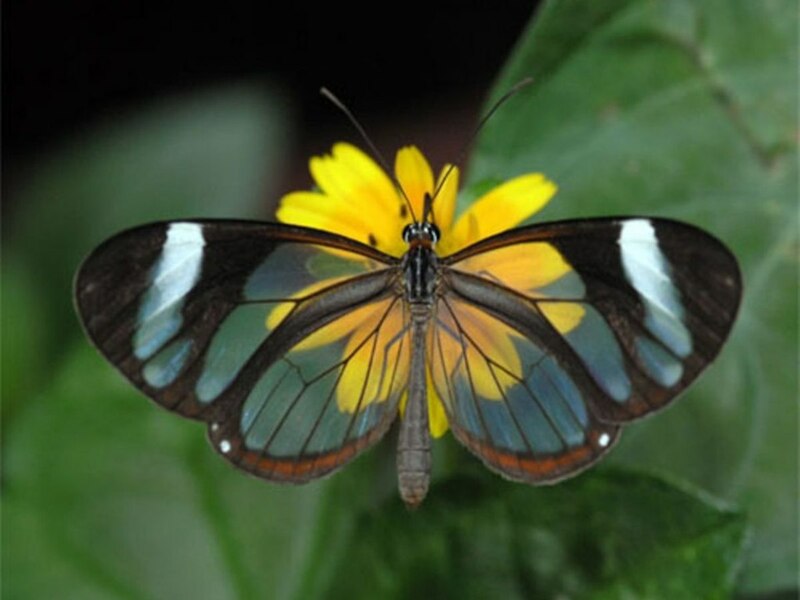 The moth that you mention would be very interesting to see in real life. Linda, thanks for another interesting and timely article. I’ve never seen these caterpillars in Minnesota, but I will definitely be on the lookout. Minnesota does have a humongous caterpillar/moth known as the Cecropia. It can be 4 inches long as a caterpillar, and has a 5” wingspan as a moth. Thanks, Maren. The caterpillars are impressive insects! Hi, Kathi. It's definitely a caterpillar to watch out for! Thanks for the visit. I have never seen the saddle back caterpillar in my area in Michigan, but if I do, I'll be sure to be careful. Thanks for sharing Linda! Hi, Flourish. Yes, it's definitely a case of look but don't touch! The caterpillars are interesting to observe, though. Who would imagine that some darn caterpillars could cause these symptoms? Definitely look but don’t touch! Very interesting article, Linda. I was especially intrigued that even the dead body is not safe to touch. I appreciate your comment a great deal, Dora. Thank you for the visit. Your biology lessons, besides being informative and interesting, raise our awareness and sensitivity toward these creatures. Great job! Thanks also for explaining the difference between venomous and poisonous. Thank you very much, Heidi! My knowledge of nature isn't really almost limitless, but I do find the topic very interesting and love to explore it. Luckily I've never seen any of these... and hope I don't. But good to know what to look out for. Thanks for sharing your almost limitless storehouse of nature knowledge! Thank you very much for the kind comment, Manatita. Hi, Mary. I liked to pick up caterpillars when I was a child, too. Fortunately, I never touched a dangerous one. Most caterpillars are harmless. It's helpful to be able to identify those that aren't. Thanks for commenting. Gosh, I didn't know there were stinging caterpillars. I've seen some pretty nasty looking ones but not the ones you've listed. Even as kids, we used to pick up caterpillars. So glad we didn't come across these. Hi, Robie. The techniques that the caterpillars have developed to protect themselves are impressive. The animals are definitely best left alone, as you say! Thanks for the comment. Wow, I always thought of caterpillars as innocent creatures, but these guys are surely tough and better left alone. Amazing the self-protecting techniques they have developed! Thanks for sharing, very informative. I also loved the videos. I appreciate your visit and comment, Bill. I've never seen them...never heard of them...my Education by Linda continues. I agree, Bill. 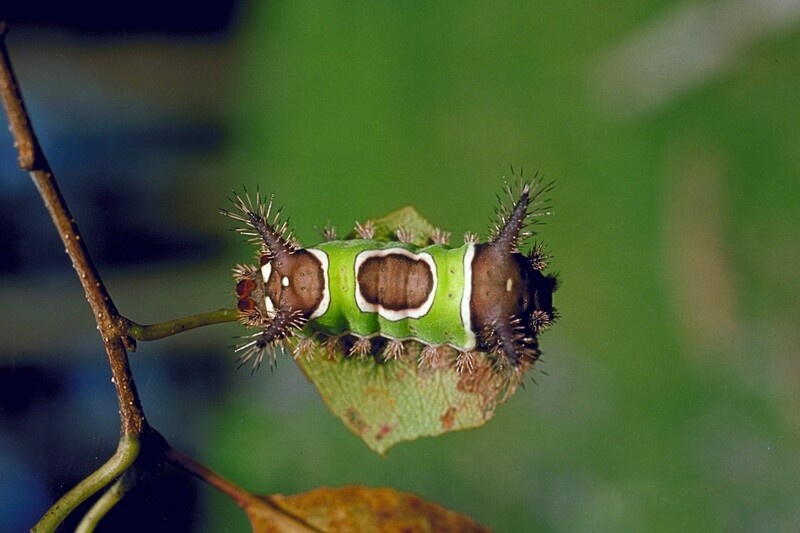 The saddleback caterpillar has an especially interesting appearance. Thanks for the visit and the comment. Hi, Larry. I think the caterpillars are attractive. There is something creepy about them, though, as you say. It's interesting that something that is so small has such power. Thanks, John. An attractive appearance and a dangerous nature is an interesting combination! Hi Linda. Interesting looking critters, especially that Saddleback Caterpillar? Can’t recall ever coming across one. Very colorful with that green saddle. I was not not aware that there are venomous caterpillars but will certainly keep this in mind while outdoors. Thank you for the education, I always learn something new through your hubs. Another interesting article by you, Linda. I have to say that those photos are kind of creepy. I have never been bitten by a caterpillar. This was very interesting, Linda. Often the most attractive insects are the most dangerous aren't they? Well-written and informative as always. That must have been embarassing at the time, though it's entertaining to hear the story now! I'm glad that everyone in the group eventually understood what was happening. Thanks for sharing the story, Jackie. Scary looking little things, aren't they? Reminds me of going to a new church years ago when my children were small and we were meeting in the back yard of some members and it was all set up with chairs and since my husband was speaking we sat up front. Right in the middle of his sermon I felt something crawling on my arm and when I looked down it was a huge hairy caterpillar. I just made a soft squeal and tried to shake it off but it would not budge and before you know it I was up screaming and moving around like crazy. Well of course no one knew my predicament for a couple of minutes so I was looking at some shocked faces thinking I was in the spirit! It was funny once it was over and everyone understood. Thanks for reminding me! I can laugh at it now. Hi, Mary. I love nature, but it does contain risks, as you say. It is important that people know about precautions that should be taken. Good to know about these caterpillars. We often don't realize the risks there are in nature. Educating the kids about them is so important. At my age, I should know this and I don't.